Are used tactical trucks available through The Armored Group? We offer used tactical trucks as well as vehicles for prisoner transport and money transport, used armored SWAT vans and other SWAT vehicles, bulletproof trucks, tactical vehicles and more. Our Ford used armored trucks and used armored cars feature state of the art engineering and design and are built for maximum protection and performance. Choose from Ford, GM, and Chrysler products custom designed to meet and exceed your protection needs. Let us be your source for used tactical trucks and so much more. 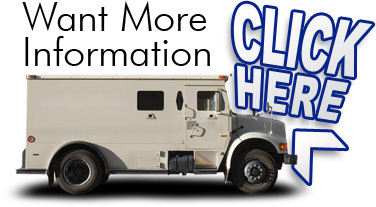 Our used armored trucks and used armored cars set the industry standard. Look to us also for used armored SWAT vans and other SWAT vehicles, tactical vehicles, bullion transport vehicles, and other options from great names like Ford and GM. At The Armored Group, we offer everything from used tactical trucks and prisoner transport vehicles to bulletproof trucks and used armored SWAT vans. If you're in the market for used armored cars and/or used armored trucks, you've come to the industry's number one source for armored vehicles. 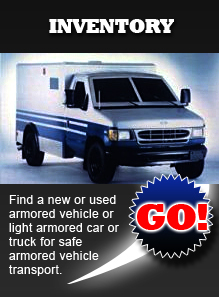 What type of used armored car might I find at The Armored Group? Can I find a used armored vehicle from a name brand dealer? Are your used armored cars all American brands? Do your used armored vehicles offer the same great performance as new vehicles? Are your used security vehicles customized to meet my needs? What types of used bulletproof trucks do you offer? What types of used SWAT vehicles are available for purchase? I'm in the market for used prisoner transport vans. Can you help? Can you used money transport vehicles be trusted as much as new ones? Copyright © 2009-2019 The Armored Group. All Rights Reserved.